Jul. 19 - Oct. 19, 2008: LogoHallucination is exhibited at HMKV, Dortmund. 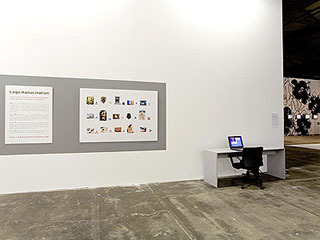 The exhibition “Anna Kournikova Deleted By Memeright Trusted System – Art in the Age of Intellectual Property” is curated by Inke Arns and Francis Hunger. The artists represented in this exhibition explore the question of art in the age of mechanical reproduction positioning itself differently in a post-Fordist era permeated with digital networks than in Fordist, analogue times to which Walter Benjamin has referred. Artistic techniques like cut-up, sampling, détournement, appropriation, copying, remixing, plagiarism, and repetition are employed. Participating artists: AGENCY (BE), Daniel Garcia Andújar (ES), Walter Benjamin (US), Pierre Bismuth (FR), Christian von Borries (DE), Christophe Bruno (FR), Claire Chanel & Scary Sherman (US), Lloyd Dunn (US/CZ), Fred Froehlich (DE), Nate Harrison (US), John Heartfield (DE), Michael Iber (DE), Laibach/Novi kolektivizem (SI), Kembrew McLeod (US), Sebastian Lütgert (DE), Monochrom (AT), Negativland and Tim Maloney (US), Der Plan (DE), Ramon & Pedro (CH), David Rice (US), Ines Schaber (DE), Alexei Shulgin & Aristarkh Chernyshev (Electroboutique, RU), Cornelia Sollfrank (DE), Stay Free (US), Jason Torchinsky (US), UBERMORGEN.COM & Alessandro Ludovico & Paolo Cirio (CH/AT/IT), a.o.